It’s a lovely almost Spring day here today at the coast. The dogs and I spent some time out in front of our house. I pulled out dead crocosmia leaves and clipped alder shoots; they took a nap in the sun. After a while I joined them, sitting down on a log that marks the boundary of my driveway, and closed my eyes to let the sunshine enter my cells that way. I’ve read it’s immediate in that skin tissue. As I sat there with my eyes closed, all of us tuning in like impromptu buddhas in the sun. It has been a morning of song for me. I woke up singing Carole King’s “Beautiful.” On the way down the street at the beginning of our walk, it was so pretty that I broke into “Oh What A Beautiful Morning,” from the musical Oklahoma!. The dogs like it when I sing, and they stayed in step well, Cotton out ahead a little,gently pulling us seniors along. It is March 14, 2018. It’s my daughter-in-law’s birthday. It’s also National Walk Out day in schools all around the nation, as children from elementary age to high schoolers, protest gun violence and call for common sense gun law reform. This morning I listened to them singing a song called “Agents of Change” in New York City and tears filled my eyes in the best kind of way. As I sat in the sun with my eyes closed, luxuriating in its warmth on my eyelids for even just a few moments, I thought of how Leo is the Sun’s sign, the sign of childhood, the opening of the heart and the courage to dramatize our most basic needs to be creative and to thrive. I wanted to sing a song for those children in honor of the sun that is shining its creative and revitalizing force down on all of them and their brave hearts this March day, a week before Spring Equinox and a month after Valentine’s Day, which will forever also be the anniversary of the Marjorie Stoneman Douglas shootings, along with my own personal anniversaries of the diagnosis of MS, and the day I changed my diet 12 years later to help me fight it. The old Carpenter’s song “Bless The Beasts and The Children” popped into my head, which at first seemed perfect, because it was a song for the dogs AND for our children. I was filled with a sudden desire to hear Karen Carpenter’s beautiful voice singing the song. I thought to myself when I go in I’m going to find it on the internet. The sun went behind a cloud. I brushed all the sticks and leaves out of the dog’s tails and we headed inside. But I wasn’t ready for the emotion that would hit me when I finally pulled the song up and listened. Right away I was aware we are living in an extraordinary time beyond this truism, where children are claiming their voices—about gun violence, about climate change, about their right to a safe and healthy world—in ways that force choices that are long overdue. This made me sad because this is what many adults would say—or used to say. And yet if we don’t support their vision for a better world we are all doomed. Perhaps, now, finally things are going to change—I believe in that future, and their vision of the world as the one I want to live in. My voice broke. I couldn’t sing along anymore. Tears welled up. As a culture we are not doing this. I cried out loud about that. 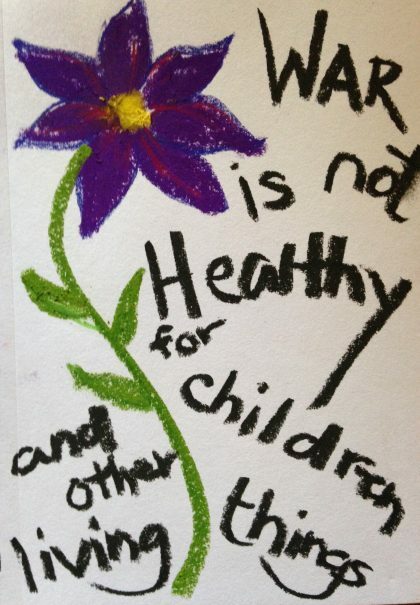 In the anti-war movement of the 60’s I remember slogans like “war is not healthy for children and other living things.” We believed in protecting them. We didn’t expect them to stand up to protect themselves. And now here we are, in this extraordinary place, where children are leading our way. So I sang along as loud as I could, sending my hope and my support for them out into the almost Spring day, along with my belief they will prevail. It’s time to re-feel and rethink absolutely everything. Thanks, Peggy. So MUCH to care for in our world. I will listen to that one of these days. Blessings to you. Hi Maria, all so true. How a society treats its most vulnerable members is a test of its morals, and we are failing. I still can’t wrap my head around the fact that you can’t buy a beer in Florida at the age of 18, but you can buy an assault rifle. (?!?) I also can’t wrap my head around the horrific cruelties perpetrated on factory-farm animals in our society without a second thought. It’s like we’ve lost all common sense. I’m so happy to see these kids taking back their power, though, and doing what’s right! At least we can hold on to that! This is a beautiful and a heartbreaking post, Maria. I’ve been so admiring of how young people are claiming their voices, to use your phrasing, but it hadn’t really occurred to me that we in the generations above them have failed to protect them and the world they live in, as older generations have always tried to do for future ones. Thank you for putting this into words.